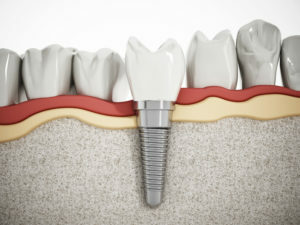 Stability – Once the implant process has been completed, your implant will be incredibly stable and solid. Chewing strength – With dentures and bridgework, you have to be careful with (or even avoid entirely) certain foods. Thankfully, that’s not the case with implants! You’ll have close to the same chewing power as you did with your natural teeth. Bone preservation – Implants trick the body into thinking that there’s still a root present in the jaws, so you won’t lose any bone mass or experience changes in your facial appearance the way you can with dentures. Longevity – With basic care and regular checkups with a dentist in Millburn, you can expect your implant to last for decades, if not a lifetime! So, why is it that implants can offer all of these advantages? There’s one main reason: they replace the root of the tooth. When most people think of their teeth, they only think of the crown, or the white portion that you see above the gumline. But in fact, the root is responsible for much of the tooth’s strength and function, so any restoration that includes it is bound to be superior! Smoking – The success rate for smokers drops to about 85%, so it’s recommended that you quit before starting the implant process. Diabetes – If you have diabetes, working with your medical doctor to keep it well managed will give you the best chance of success. Gum disease – While implants can’t get cavities the way that natural teeth can, it’s still crucial that the gum tissue that supports them stays clean and healthy. How Can Implants Change Your Life? While it’s true that nothing is quite as good as your own natural teeth, there’s no question that implants are the next best thing. They can change your life because they restore more than just your smile – they give you back your self-confidence as well! As an award-winning dentist with many years of experience, Dr. Robert Shick can attest to the life-changing power of implants in patient’s lives. From increasing chewing power to enhancing the smile, he knows that implants are the best available option for tooth replacement. If you have any questions, he can be reached via his website or at (973) 921-9097.